The wait continues for former New York City Mayor Rudy Giuliani. Rumored to be in the mix for Attorney General (lost out to Senator Jeff Sessions), Secretary of State (now reportedly off the short list), Secretary of Homeland Security (nope), and Director of National Intelligence (never mind), Giuliani has been left to wonder whether his vocal support of President-elect Donald Trump will be rewarded with a cabinet post. That support, which played out on the cable-news circuit and reached fever pitch on the convention stage, has invited a litany of articles pondering “what happened to ‘America’s mayor’.” Did the man who once claimed to be “much closer to moderates in both parties than extremists in either” and “previously lent support to gay rights, gun control and open immigration” make a “calculated [political] gamble,” or simply “[lose] his mind”? Things weren’t always this way for Rudy. Propelled by 9/11 and unblemished by public office or political campaigns after concluding his second term as mayor of New York in 2001, Rudy Giuliani was the most popular politician in America in 2006. 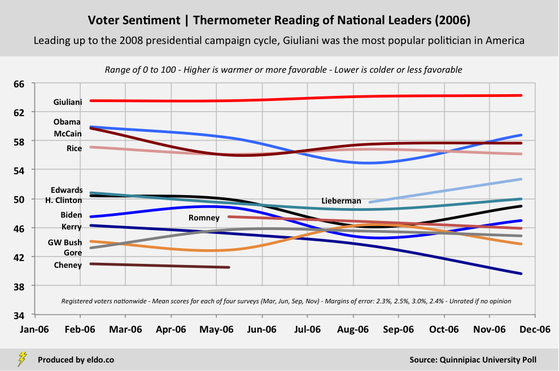 Throughout the year, he rated better than leaders of both major parties in Quinnipiac University’s national “Thermometer” survey, a measure of voter sentiment – in most cases by a significant margin. ​It was an enviable position in the lead-up to the 2008 presidential election. And voters were poised to see it through. As John Edwards, Joe Biden, Hillary Clinton, Barack Obama, Mitt Romney, and John McCain announced their candidacies in late 2006 and early 2007, they were met with the same news – whether in the Republican primary or general election, Rudy Giuliani would beat them all. Early in the year, Rudy owned 40% of the “if the Republican primary were held today” vote. McCain, the eventual nominee, was second with 18%; Romney was third with 7%. 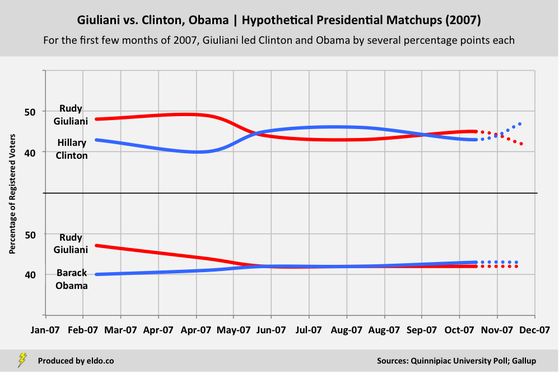 Leading up to Memorial Day 2007 – which voters claimed they would most like to spend with Giuliani (Rs) or Obama (Ds) – the former mayor bested Clinton and Obama in hypothetical presidential matchups by several percentage points apiece. In blue states, he ran neck-and-neck with Clinton and polled 11 to 13 percentage points ahead of the lesser-known Obama. There is, of course, no reward for leading early polls, winning hypothetical races, or projecting to do well in the other party’s strongholds. As Giuliani learned, cross-party appeal can be a curse in the primaries. The pro-choice, pro-gay rights, pro-gun control, pro-immigration, pro-sanctuary city mayor – twice elected in a city where Democrats outnumbered Republicans five to one – was punished by the Republican faithful. ​On top of his views, Giuliani’s big-state, Florida-and-Super-Tuesday primary strategy proved “disastrous”. He finished sixth in Iowa (with some below-the-radar presence), fourth in New Hampshire (where he likely competed more than his campaign claimed), sixth in Michigan, Nevada, and South Carolina, and fourth in Florida, after which he withdrew. The one-time frontrunner won zero delegates. Maps of the Republican primary offer no trace he even ran. 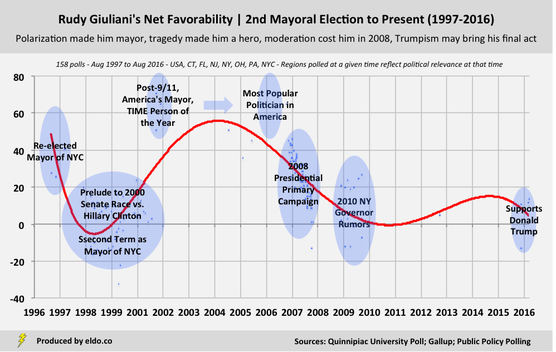 As polarizing as Giuliani was as mayor – prior to 9/11, his average second-term net favorability was +38% among white New Yorkers, +6% among Hispanic New Yorkers, and -39% among black New Yorkers – many view his recent return to political theater as most controversial of all. He is, nevertheless, more popular nationwide today (+14%) than he was toward the end of his far-less-divisive presidential campaign (+1%). Love him or hate him, Giuliani's political journey might explain why he's played his hand the way he has. Polarization made him mayor. Tragedy made him a hero. Moderation made him a loser. Trumpism may bring him his final act. Giuliani didn't endorse Trump until April (after two-thirds of the primaries) and he initially resolved not to campaign for him. Some wondered "what happened to Rudy" early last year, when Giuliani questioned President Obama's love for America. States that voted for John Kerry in 2004. Giuliani qualified some of these positions during his presidential campaign, but compared to many presidential candidates, his adjustments were more tip-toes than flip-flops. Today, the ratio of registered Democrats to registered Republicans in NYC is 6.7 to 1. ​ Fred Thompson is occasionally mentioned as another cause of Giuliani's demise. Thompson hurt him in the polls, but Giuliani's downward trend was well under way. Average results of Quinnipiac polls conducted between February 11, 1998 and July 25, 2001. As politicians go, net favorability of 1% isn't all that low. Bush (2004) and Obama (2012) won re-election with similar ratings. Clinton and Trump are far less popular. ﻿﻿The data sources for this article are the Quinnipiac University Poll, Gallup, and Public Policy Polling. Data was compiled and analyzed by ELDORADO. All charts and graphics herein were created by ELDORADO.